Happy Monday everyone! Today we got a special shirt for you with free embroidery on s one-of-a-kind Nike golf shirt. Like most of the Nike apparel ,This is a top of line Dry-fit moisture management shirt, but it's also unique in its own way. What's amazing about it is that is so well engineered with the fabric you feel the difference once you put it on. It is so fitting soft and very breathable. Like all of the Nike products and holds up well and stays for years and years. It's well tailored for the females. The secret behind the success of the shirt is that it has 13% not 5% ,13% spandex which makes a stretchable more than even a standard polyester. So don't wait order 12 or more of this beautiful shirt and get the embroidery free. That's $120 savings when you this order this week the Nike golf. A beautiful and luxurious addition to any wardrobe. Subtle ottoman texture meets the unrivaled performance of Dri-FIT moisture management technology. Engineered with a bonded self-fabric collar for classic refinement. Five-button placket. Heat transfer label for tag free comfort. Pearlized buttons with metal rims. Open hem sleeves. 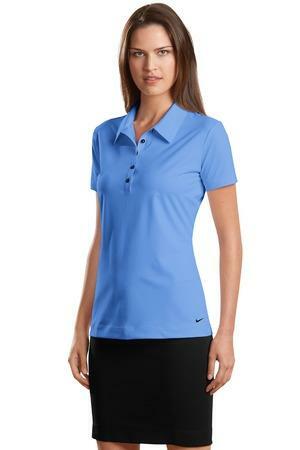 Tailored for a feminine fit with an upper back pleat and contrast heat transfer Swoosh design trademark on the left hem. Made of 5.61-ounce, 87/13 polyester/spandex Dri-FIT fabric.